Exactly how much do you need to make compared to what you make now? You’ve got to know your numbers in order to do this well. You can’t just make them up, as nice as that would be. Not only that, but you need to know your current numbers as well as your desired numbers. You can’t make a concrete plan if you don’t know where you’re at and where you’re going. 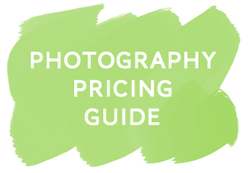 This is where I shamelessly plug my free pricing guide series. It’s going to take you some time to work through it, but you need to do it. Twice in fact. Do it once based upon realistic numbers that you hope to have in the next 12 months (so for example, if you haven’t booked any weddings, don’t plan for 30 weddings a year because it’s highly unlikely that you’ll book 30 weddings in the next year without any under your belt). Then do it again based upon your desired future numbers. This is especially helpful if you’re looking to leave your full-time job to do photography full-time instead. Your needed profit as well as workload will be different between now and then. The nice thing about this is that your current needed profit may be less than what you’re hoping to make in the future. Compare your current desired numbers to what you’re actually making. So if you are currently averaging $200 a session but your calculations say you need to be averaging $400 per session now, and $1000 per session when your business is where you want it to be, you can use these numbers to plan how to get there. The easiest way to do this is to use the Pricing Guide Workbook that I offer in addition to the free pricing guide series. You don’t NEED it, but it will allow you to make easy adjustments without having to go through the math again and again, and it’s super simple to do 2 separate versions of the guide to compare. This is a huge step that people often miss. Can you make the extra income you need by booking and shooting more clients? You may or may not have the time to shoot more clients or may not be able to book more, but it’s another option. Photography isn’t the best model to try and do in quantity, since your services are limited by how much time you have and are harder to multiply, but it’s a viable option for some people. Are you doing everything you can to maximize sales at your current prices? If you are a portrait photographer and don’t do in-person sales, you could be making 3-5 times as much income through simply changing how you present and sell your images to clients without having to change your prices at all. 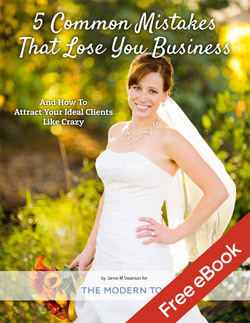 If you’re a wedding photographer, you may be losing out on income because you don’t have wedding packages that sell. Before increasing your prices, start with this step. You may find that it works better than simply increasing how much you are currently charging for your products and services. Not sure it will work for you? Read several in-person sales success stories in this post in our private Facebook group (just request to be added if you’re not already part of it). So, you’ve done everything you can to maximize your sales at your current pricing levels and you know you need to be charging more. A lot more. So how do you do it? This seems to be how most people approach price increases, and it works in certain situations but more often ends up in frustration like I mentioned in the intro, so it isn’t for everyone. This is great for when you want to get out of the deal-seeking clients completely and truly start targeting clients who are willing to spend more. If this is you, you’ll likely want to make a bigger jump up front as your low prices may be pushing the quality clients away. This is exactly what I did when I was wanting to book wedding clients that valued photography instead of people just looking for a deal that needed any photographer and didn’t really care. I more than doubled my rates after only shooting a few weddings but starting to book for the future far too fast. However if you’re not also working on marketing and other factors that will help you book those higher-end clients, you’ll likely end up discouraged and it may hurt your business more than it helps. Risks of just jumping in and doing it all at once: You will lose almost all of your current clients if you’re a portrait photographer, and you’ll basically be starting over with a new target market and WILL have a booking lull. If you’re a wedding photographer, inquiries will likely slow down, but they will pick back up if your image quality and marketing matches the prices you are now charging. There’s just fewer people who appreciate photography and are willing to pay more for it than there are deal seekers. But it’s a much better type of client to have, and you’ll make more for the same or less work. Just be warned, it’s a bit like pulling a band-aid off all at once. It’s not easy, it’s not pleasant, but if you’re looking for all new clients it might be best. You’ll want to make sure that you don’t rely upon your current photography income in order to pay bills, though. It does mean making sure your work is good enough to be charging that much and it will likely mean changing up your marketing to more effectively reach and appeal to people in a different target market. I’ll be speaking more to the marketing part in the next few months. Appealing to your new target client + having higher prices that show that your work is worth it + having beautiful work will get you the clients you are looking for, but it may take a bit to get the word out. If you’re really priced low, you may have a hard time keeping any clients because they’re always going to go for the deal and there will ALWAYS be someone cheaper. I promise. They will tell you that you are priced too high no matter how low your prices are, and you have to learn to ignore them or you’ll only get discouraged. But if you’re making some money and have some clients who have really enjoyed your work, but you need to make more, the best bet is to create a plan for getting from where you are now to where you want to be. Let’s say you’re currently making an average of $200 per portrait session and you eventually need to be making $1000 per session. Plan to do this slowly over as much time as you need. So for example, make it your goal to increase your average session to $400 in the next 6-9 months, then $600 in the next 6-9 months, and keep going until you get there. Plan your price increases and be diligent about implementing them. Or, do it based upon the number of sessions or weddings you are booking. Jasmine Star raised her prices a little bit after every 3 wedding bookings until she got where she wanted to be. So do a small 10% increase to your sessions after every 10 sessions, or after X numbers of weddings, or at an increment that makes sense to you. By planning out your gradual increases, you’ll keep more clients around and they won’t be as shocked by the increases. Risks of doing gradual price increases: Two big risks. First, you may not make more money fast enough which could be a problem if you’re relying upon your income. Second, It’s also very possible that you’ll get comfortable, make excuses, or have something that keeps you from doing regular increases over time. So if you’re going to go this route, you’ll need to make sure and plan it out and stick to your plan. The absolute best way to handle this is to set expectations up right from the start. In fact, if you’re just getting started and know you’ll be raising prices over the next few years significantly, call your pricing guide the “Winter 2012 Pricing Guide” and tell them that a new one comes out every season or something along those lines. Then if they come back in the future asking for old prices, you can simply say that they no longer apply and that these are your new prices. If you have significant increases and you have a returning client, make sure they know that right away before they commit to anything. You don’t need to explain yourself or justify your prices. It’s not helpful, because honestly they don’t care. Do you care how much it costs Canon or Nikon to make your camera? No. You just care about what you get and what you pay. “Great to hear from you, Prior-Client-of-Mine! I’d absolutely love to work with you again. Just so you know, I’ve refined the way I do my portrait sessions to help ensure that you get exactly what you are looking for from the session. Instead of doing an online gallery I now am doing all in-person ordering sessions to help you select the best images from your session. Also, please note that my prices have been revised since the last time you were here, with a session fee of $X and [prints/packages/whatever you are selling them] starting at $Y. You can see all the details here [insert link or attach pricing to email and tell them]. I just wanted to make sure you’re aware of the changes so that you know what to expect. My main goal is to provide you with the best experience I can. When you are ready to book your appointment, [insert call to action here]. You might be tempted to offer them discounts, but don’t. It’s a super slippery slope, because then they’ll always expect them in the future, and if they aren’t willing to pay full prices now they won’t be willing in the future either. 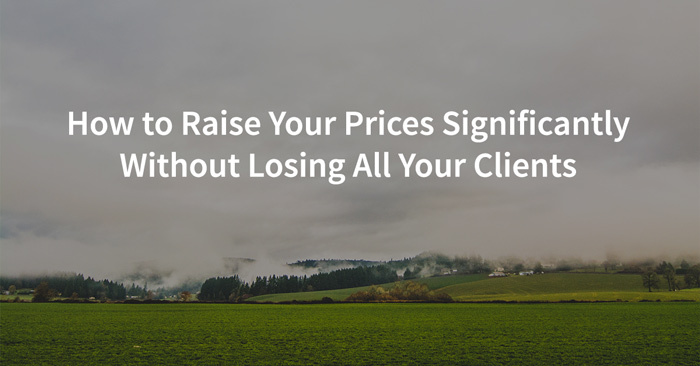 I know it’s hard to let a client walk away, but you will need to do that as your prices increase. You simply cannot be everything to everyone. You can have a varied of services and packages that might appeal to a larger crowd, but really you should be selling to your ideal client, not to anyone and everyone or you’ll have a hard time becoming successful. The best part of this is that people who really value working with you will stick with you and pay your new prices, and as your prices increase you’ll attract more and more clients who value photography. The people who only want a deal will always say you’re too expensive and go elsewhere, and you should let them. They aren’t worth it. A great way to book a bunch of extra business is to tell everyone that your prices are increasing in 2 weeks, but that you’ll honor your current prices for anyone who schedules a sessions before the price increases that takes place within the next X months. So if you’re increasing your prices at the end of September, they have until the end of November to actually have the session as long as they book it and schedule it before the prices go up. It’s a way to tell your clients about the price change, give them one last opportunity to get your current prices, and ensure extra business for the next few months. Raising your prices is never easy, but it’s often necessary to having a successful business. Figure out which method is best for you and go for it! Like this post? Click “Like” below and leave a comment! Would love to hear your thoughts on raising prices.